To say it was a dream come true would be an understatement. A Calgary-area superfan and aspiring country music star was called up on the stage and even sang a duet with Keith Urban at his Calgary concert on Sunday evening. To say it was a dream come true would be an understatement. 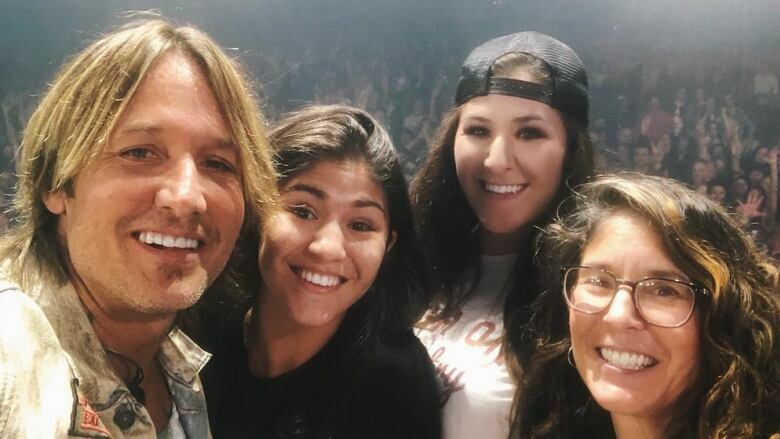 A Calgary-area superfan and aspiring country music star was called up on stage and even sang a duet with Keith Urban at his Calgary concert on Sunday evening. "It was such a crazy experience," Michela Sheedy told The Homestretch Monday afternoon. "Me and my family have loved Keith Urban for a very, very long time. We have seen every single show in Calgary since 2005, so it was incredible to finally have this special moment happen." The 23-year-old and her family from Okotoks, Alta., brought signs to get Urban's attention. "I wrote on my sign, 'Will trade my sister for a chance to sing with Keith Urban,'" Sheedy said, of her younger sister Chiara. "She also was holding up a sign that said, 'Take me.'" And get his attention, the signs did. Sheedy was called up on stage, along with her sister and mother, while dad stayed in the audience to capture the performance on video. Sheedy and Urban did a duet, We Were Us. "I had always pictured it in my head that if I ever had that moment where he would notice me in a crowd and I got to sing with him, it would be that song," she said. "It is one of my favourites out of the many favourites I have. It was even cooler when he started singing with me on the microphone and I almost passed out, I swear." Sheedy is no stranger to public performances and a love of country music. "I sing the national anthem for the Calgary Flames when George Canyon can't be there, so I have sang in that building when it's full, but there was something about the energy of that crowd and also the fact that I was standing next to Keith Urban and he had just given me a big sweaty hug," she said with a laugh. "I always knew I loved singing, but I didn't know how to describe my genre. The country music community has welcomed me with open arms and helped me solidify that country is the way I want to go." And while Sheedy has been singing country professionally for about five years, it was this performance that got a lot of social media clicks. "It has been very overwhelming. I woke up very, very early because my phone would not stop ringing and buzzing. Usually I can sleep through it but I couldn't today. I've had a lot of support on social media which is really incredible." Sheedy will take to the stage to share her music later this week as part of Project WILD - Country Artist Development in Calgary.